Yesterday was the distribution of report card for the first trimester. I thought of going to our son’s school alone, but the little boy wanted to go with me so he could see (and probably play) with his classmates while I was consulting with his homeroom adviser regarding his class performance. 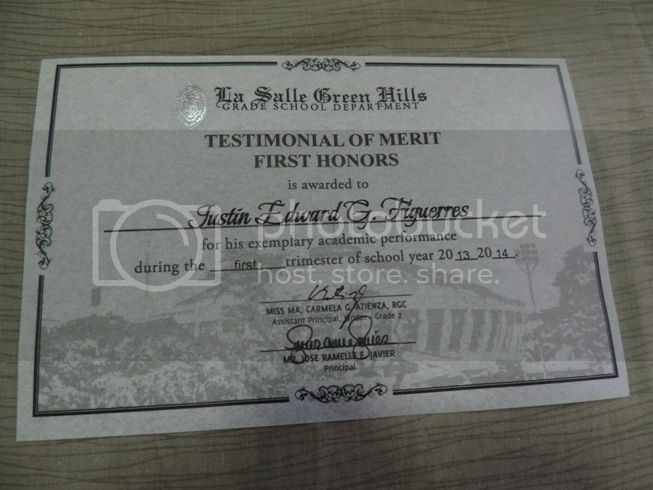 Justin was included in the First Honors list. He also received two certificates, one for Outstanding Conduct and another for Perfect Attendance. Congratulations, son! You did your best, and your hard work paid off. We’re so proud of you! 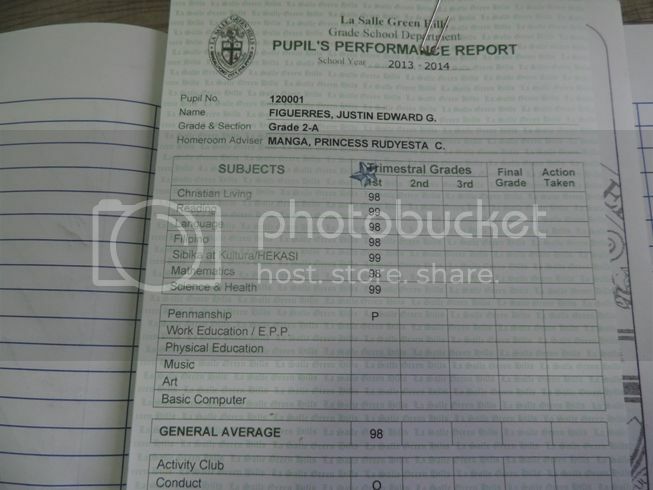 This entry was posted in First Trimester, Grade 2, Report Card. Bookmark the permalink. Grabe taas ng grades 😀 Congrats to you and your son 🙂 I watched a movie last night about kids who have dyslexia and how people can deal with them. One of the most important pointers in the movie is the fact that every kid is special. The movie made made me shed some drops of tear. Congrats to you too Mommy Tetcha. Ang tyaga mo magturo kay Justin. congratulations Kuya Justin + mum! well done! WOW! Congratulations Justin! This is surely one proud mommy moment! ← Rock-Bottom Promo Fares from Tigerair!